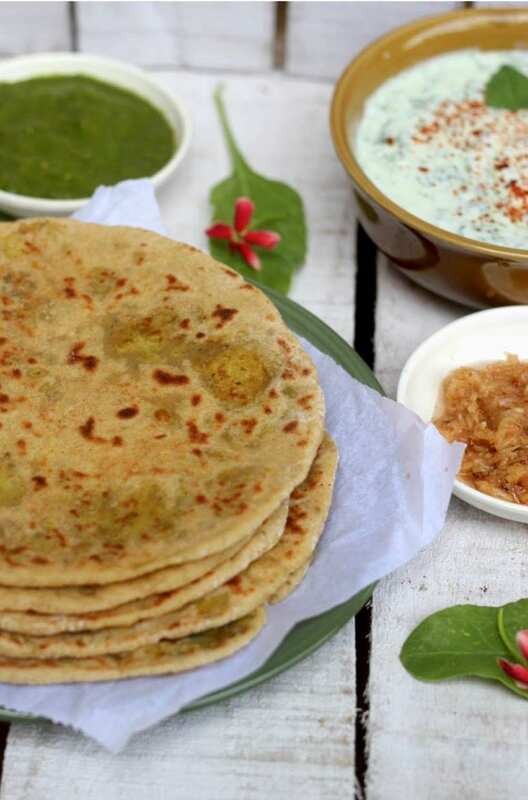 Alu paratha or potato stuffed Indian flatbread is possibly the most popular stuffed paratha. I have never met anyone who did not like a hot alu paratha straight off the tava, served with a cube of butter that melts in the heat of the paratha to make a small pool of fatty goodness to top the carb indulgence. Perfect for an indulgent breakfast or as a part of lunch or simply heating up the leftovers for an anytime snack, alu paratha is simply unbeatable. I have fond memories of my grandmom preparing alu parathas for my school picnic lunch box. It was a kind of ritual, picnics meant alu parathas in the tiffin box. Over a period of time, I have perfected the recipe for the best homemade alu paratha and instant yeast is the secret ingredient that gives the most soft and fluffy outer casing, and it stretches beautifully, allowing you to stuff a great deal of filling without the covering dough tearing. You can try this with any other stuffed paratha recipe. 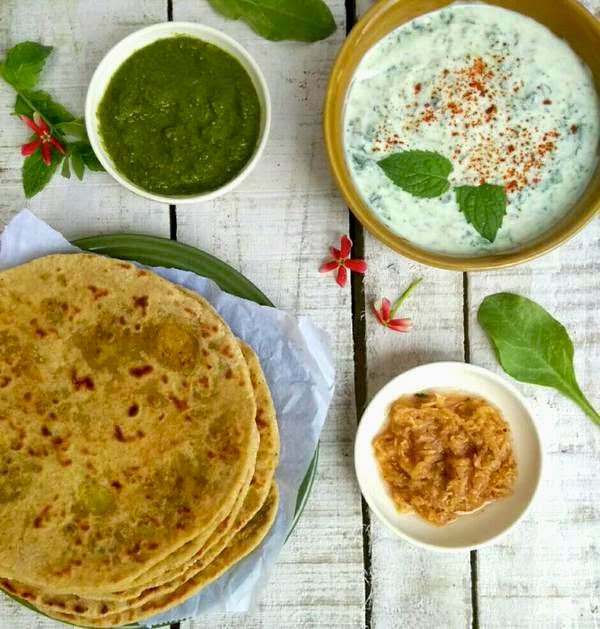 Here, I have served with spinach raita, raw mango and onion chutney and green chutney. You can serve with whatever pickles you have at home or even plain yogurt is perfect. To make dough:First activate the yeast. In a small bowl, add yeast, sugar and lukewarm water. Stir well and keep covered in a warm place for minutes until frothy. Yeast is ready for use. In a large bowl, place the atta, salt and add the activated yeast mixture. Bring together to make a dough, using sprinkles of extra water to bind to a smooth dough. Knead well for 5 minutes, using 1 tsp oil towards the end. Cover and keep aside until doubled in volume ,around 1 hour. To make filling:In a pan, heat 1 tsp oil. Add the asafoetida, cumin seeds, mashed potatoes, along with all the dry spices and stir until well combined. Remove and cool to use as stuffing. Lightly punch down risen down and divide into 4-5 equal portions. Proceed with the recipe as shown in the video above. To make parathas:Roll out each portion into a 3 inch circle. Place a generous portion of stuffing in the center. Add a pinch of dry flour on top of this. Bring together the edges and pinch the top to seal. Flatten this stuffed ball of dough on your palm lightly. On a floured board, with a gentle pressure, using a rolling pin, roll this out into a paratha. Take care to stretch out from the edges and not thin out the center as it may tear and filling will come out. Heat a tava and place the rolled out paratha on the tava. Cook on medium heat for 1 minute or so. This depends on the thickness of the paratha. Turn over and cook the other side, meanwhile apply oil or ghee to the first cooked side and turn over again until the first side gets golden spots and the paratha puffs up on the tava, by pressing gently with a spatula. This process is very simple and easy to understand if you watch the video above. Remove onto a plate and eat piping hot served with raita, pickle, chutney or all of them! Hi! I tried making the dough today with plain chapati flour but it was not as spongy and the parathas kept breaking. My yeast was frothy and perfect. I wonder what went wrong! ???????? Is it because it required more kneading? Or maybe more time to rise?